‘Karen Ballerina,’ 21 inch. Composition. 1946 by Madame Alexander, inspired by the Margaret O’Brien, Cyd Charisse and Karin Booth movie The Unfinished Dance. 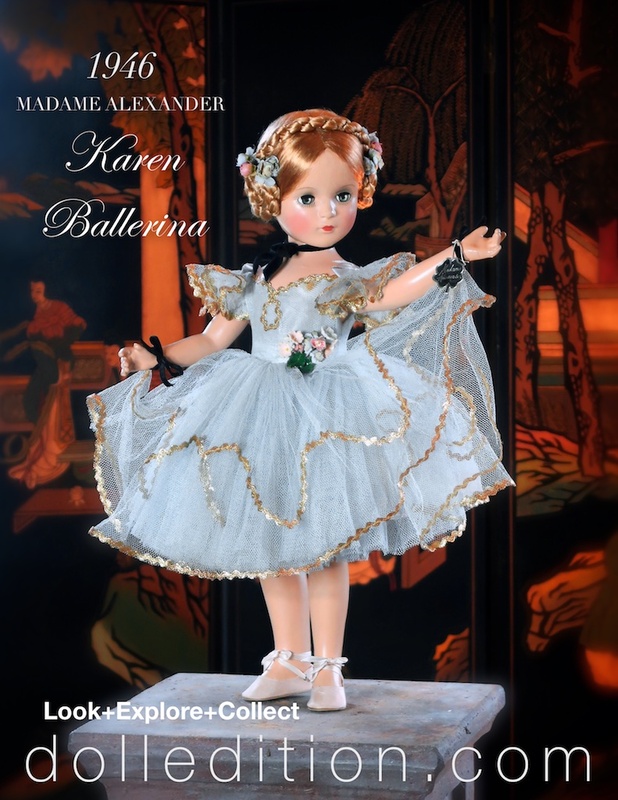 By 1946, the year “Karen Ballerina” was produced, Madame Alexander was taking her dolls to the level of art. Production in composition had been mastered, with many fine production details and layers that become the standard of the dolls created by Alexander. “Karen Ballerina” came in three sizes 15”, 18”, 21” and the costume came in blue, pink, green, white and yellow. She uses the Margaret mold, one of the most beautiful molds produced for Alexander. The doll also would be made the transition year of 1947 from composition to hard plastic. “Karen Ballerina” was influenced by a Margaret O’Brien movie filmed in 1946 and released in 1947 - The Unfinished Dance. It’s a movie set in the world of a ballet company, with three featured characters, also ballerinas in the film: Margaret O’Brien (Meg Merlin), Cyd Charisse (Ariane Bouchet) and Karen Booth (Anna La Darina). The 9-year old Margaret trained for six months with Russian ballet teachers and did her own dancing in the film. In the story, the character of Karin Booth is the visiting Prima Ballerina of this trio, who becomes an unknowing victim of a plot to remove her from performing the lead in Swan Lake. Karin Booth was getting a big starlet build-up in this film by MGM Studios to take her to the next level. A former model, Karin Booth was playing her first leading role. A double was used for her dancing. While her co-stars would ultimately have the more significant name recognition, “Karen Ballerina” would go on to become one of the all-time classics of Madame Alexander. “Karen Ballerina” inspired by the 1947 movie The Unfinished Dance - a massive and lavish MGM extravaganza built around the world of ballet. Spectacular costumes for the film were done by Helen Rose and costume supervisor Irene Lentz. Esteemed MGM costume designer “Irene” was just leaving MGM to go on her own, with Helen Rose taking her place. ‘Karen Ballerina,’ 21 inch. Composition.1946 by Madame Alexander costumed in nylon net with satin bodice and gold rice-rack trim. Karin Booth - Played the Prima Ballerina with Margaret O’Brien in MGM spectacular The Unfinished Dance. Above: Cyd Charisse & Margaret O’Brien - this was young Margaret’s favorite role. She studied ballet for six months for the part of “Meg”. 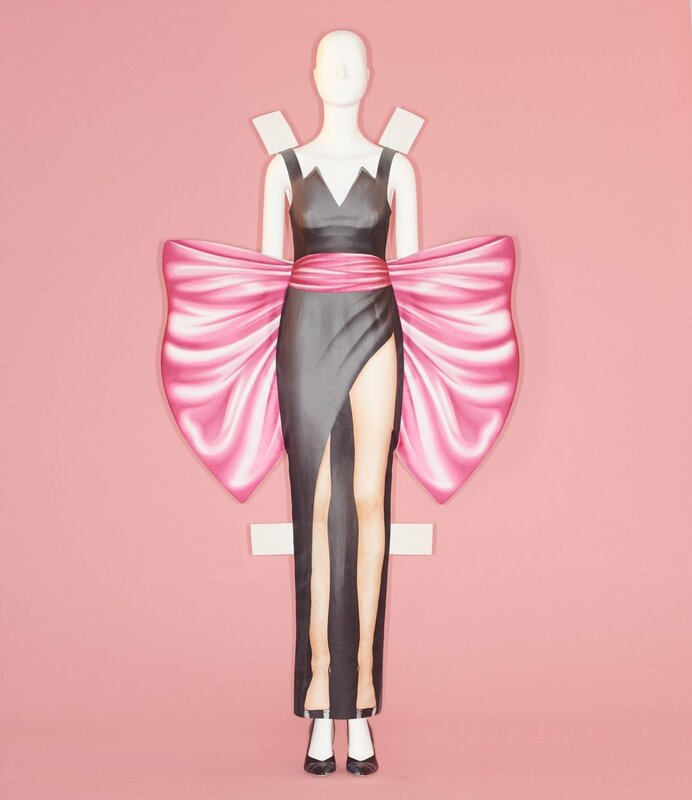 Featuring about 200 objects, both fine art and fashion, “Camp: Notes on Fashion” will trace the origins of the subject from the 17th century, specifically the court of Versailles, to the present day, when disruption and duplicity are the common currency. Sontag’s line, “Camp sees everything in quotation marks,” might bring to mind certain tweets; the cringey two-handed, double-fingered “quote” gesture; or—more happily—Off-White’s cheeky “For Walking” boots. What happens when you are the world's most famous designer? Apparently, companies design a lot of dolls after you! Karl Lagerfeld already has a Steiff teddy bear, Tokidoki doll, Ken doll... and now the most renowned doll of them all will be imitating Monsieur Lagerfeld: Ms. Barbie!